Glad to be back at Mediteca for an Italian Christmas feast! From my previous visits, I have had such a wonderful Mediterranean experience that I was really looking forward to another meal at Mediteca. A first for me, I was curious about an Italian Christmas menu. Chef Riccardo Ferrarotti, inspired from Southern Europe cuisine, has specially prepared the dishes from his family’s recipe that he has been enjoying each Christmas since young. Mediteca is perfect for a holiday cheer with its warm soft lighting and ambience. All set for the holidays, the warm ambience has Christmas tree glowing in one corner and more festive décor is dressed subtly throughout the restaurant. Mediteca has a Christmas Eve and Christmas Day Set Menu for RM158++ per person for a four course meal plus coffee or tea and a glass of Prosecco. Kids below 12 years & below gets a complimentary meal. Complimentary warm Italian bread and grissini is served with a glass of Prosecco in the set dinner. Dinner starts with Capunet from The Chef. Capunet, a Tuscan stuffed cabbage leave roll, is what Chef Riccardo and his family enjoy for most festive meals. He remembers fondly how his mother would prepare this dish and wanted guests to experience his beautiful memories of this holiday dish. He uses savoy cabbage and wrapped it with minced meat and cheese béchamel sauce before baking it. The capunet is served with a garlic and anchovy emulsion. The roll yields at the cut of a fork, oozing with soft juiciness. Sweet cabbage with savory filling and a creamy goodness, the aroma of this dish is very tantalizing. I adored the garlic and anchony emulsion, strangely subtle and moreish. Our next course was a Croatian Omelette playfully served in a can and a side of rocket salad on a wooden board. It was pretty great with the presentation as it plays on the Christmas mood of opening a present to see what’s inside. The omelette flavors are delicate while the texture is delightful. Forking into the fluffy eggy omelette, I had also taste bits of bouncy octopus, fresh peas, fontal cheese and herbs. This course is really light, delicate and shows off the egg flavors to its max. Contrasting beautifully is the side rocket salad which was lightly dressed in a tangy dressing to lift up the flavors of the omelette. The next course is the ultimate dish for me. I have never tasted gnocchi so light and fluffy that it simply melts upon contact on my tongue. Seirass Ricotta Gnocchi is out-of-this-world. Chef Riccardo uses a mixture of ricotta cheese and without any potato which is what most gnocchi are made of. The little thumb size pillows are so fluffy and cheesy. Cooked in a vegetable stock, the ricotta gnocchi is finished off in a buttery thyme sauce and herbs before being crowned with black potato, or more often known as black truffles. A truly comforting dish made so well that it takes indulgence to new heights with something so simple. I simply cannot stop myself from polishing off this dish wholeheartedly. Salty, cheesy, creamy, buttery, aromatic and fluffy, I continuously raved about this dish to Chef Riccardo, hoping he may share his secret to this light ricotta gnocchi recipe with me. Main course features two options with a robust Pork Tenderloin wrapped with Bacon or Pacific Se Bream. The Pork Tenderloin was stuffed with terrine foie gras and wrapped with bacon before being baked. Dressed in marsala sauce and served with a luscious potato dauphinoise, the pork fillet dish is gorgeous. Tender and lean, the addition of bacon rendered a good note of flavors to the pork. The marsala wine sauce has great depth of flavors, adding more oomph to the meat. I could also see and taste rosemary and garlic in the dish. Dauphinoise potatoes completed the dish with its much welcomes creamy and cheesy flavors. If you prefer fish or more delicate flavors, then Pacific Sea Bream with potato gratin, olives, fennel and basil accompanied by own broth will be just right for you. The white fish is light, sweet and flaky. A blanket of paper thin green and yellow zucchini slices protected the fish to retain its delicate texture. The fish is served in a basil emulsion with chargrilled fennel, basil and olives together with potato gratin. The lots of herbs used in this dish are a great way to aromatize the dish without overpowering it. The dish is best eaten while its hot for maximum flavors. Dessert was a gorgeous traditional Christmas sweet featuring Warm Panettone Gateau smothered in thick creamy anglaise sauce and chocolate. You get sweet soft gooey goodness at first bite. Soft fluffy and studded with bits of dried fruits, the gateau shouts Christmas in all ways. The dessert is quite heavy and rich so sharing it may actually be a great idea. Coffee or Tea to end the meal. My little one loves their pasta and he got a complimentary Carbonara Pasta that was so good, we ended up stealing this a little from him. 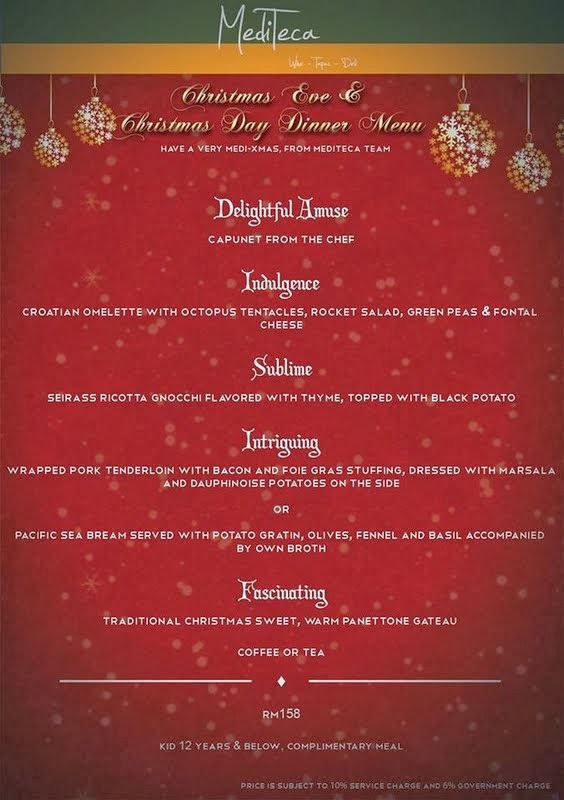 It is an amazing modern European festive set dinner menu that you won’t want to miss. Value for that price, it certainly takes one to another world of gastronomical dining experience right in the heart of the city for the festive holidays! For New Year’s Eve Celebration, Chef Ferrarotti has designed an elegant 5-course dinner, priced at RM168++ with a glass of bubbly upon arrival. Start the dinner with a Tapas Platter of Shallots stuffed with venison, Octopus Bite as well as Iberico and Tomato. Second Course; Veal Muse in Catalan Style with Warm Crunchy Music Bread. Enjoy the third course of Risotto with Barolo Wine and Foie Gras, follow by Main Course of Cotechino Sausage with stewed lentil and lard or end with Chef’s fish choice that will give a taste of freshest seasonal seafood. To complete the holiday meal, enjoy the Warm Panettone Gateau. What’s more, sit back and relax and enjoy yourself with the Acoustic Jazz Performance exclusively arranged on these special days! Yummm!!! I'd love that dessert! Slurpssss!!! !